My first thoughts about the University focused around how fantastic it was. The Highfield Campus had a lot of green open space, and the National Oceanography centre just blew me away. As soon as I visited the University I knew that it would be my 1st choice with regard to where I wanted to study. Your degree from Ocean and Earth Science means that you have been taught well and gained a sound base from an internationally recognised institution to build upon in your chosen career. It can be really daunting when thinking about what course to do, but geophysics seemed to fit me perfectly- when I read the prospectus it felt like it had been written just for me! The course was extremely flexible, allowing you to pick and choose modules from a number of different departments around a core of compulsory units. Currently I am a senior geophysicist for a company specialising in shallow and archaeological geophysics. 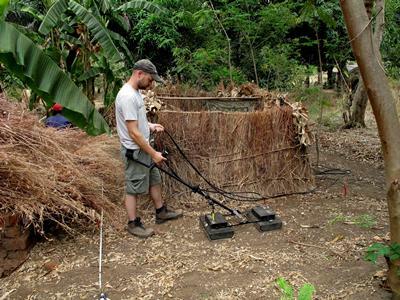 I have specialised in one area, called GPR (ground penetrating radar) but use all of the techniques initially learnt at Southampton in the work I undertake. As well as working internationally on a wide variety of projects the company is also well known for being behind the geophysical aspects of Time Team on Channel 4. For the last 8 years I have been their GPR specialist, and you can usually see me knocking around in the background. Very occasionally they also let me speak, however blink and you might miss me! Advice I can give to current students is to have confidence in your degree.